Full neurological examination is needed, looking particularly for signs suggesting a central lesion, such as hemiparesis, tremor, loss of balance, involvement of the Vth, VIth, or VIIIth cranial nerves. The following investigations may be indicated [Table 1]. Chan EH, Tan HM, Tan TY. Facial Palsy from temporal bone lesions. Ann Acad Med Singapore 2005;34:322-9. Katusic SK, Beard CM, Wiederholt WC, Bergstralh EJ, Kurland LT. Incidence, clinical features, and prognosis in Bell's palsy, Rochester, Minnesota 1968-1982. Ann Neurol 1986,20:622-7. Friedrich NA. De paralysis musculorum facier rheumatica. J Erfindungen (Gotha) 1798;8:25. Gilden DH. Clinical practice. Bell's palsy. N Engl J Med 2004;351:1323-31. Morris AM, Deeks SL, Hill MD, Midroni G, Goldstein WC, Mazzulli T, et al. Annualized incidence and spectrum of illness from an outbreak investigation of Bell's palsy. Neuroepidemiology 2002;21:255-61. Doshi D, Saab M. Bell's palsy in children: Is there any role of steroid or acyclovir? Hong Kong J Emerg Med 2007;14:233-6. Hato N, Kohno H, Yamada H, Takahashi H, Gyo K. Role of nitric oxide in the onset of facial nerve palsy by HSV-1 infection. 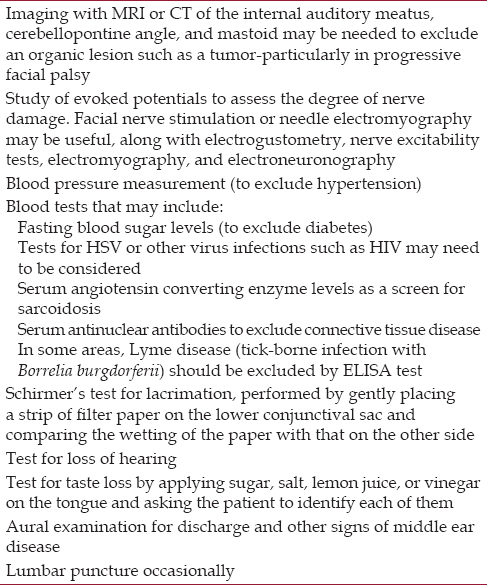 JAMA Otolaryngology Head Neck Surg 2013;139:1339-42. Turriziani O, Falasca F, Maida P, Gaeta A, De Vito C, Mancini P, et al., Early collection of saliva specimens from Bell's palsy patients: Quantitative analysis of HHV-6, HSV-1, and VZV. J Med Virol 2014;86:1752-8. Engström M, Berg T, Stjernquist-Desatnik A, Axelsson S, Pitkäranta A, Hultcrantz M, et al. Prednisolone and valaciclovir in Bell's palsy: A randomised, doubleblind, placebo-controlled, multicentre trial. Lancet Neurol 2008;7:993-1000. Sullivan FM, Swan IR, Donnan PT, Morrison JM, Smith BH, McKinstry B, et al. Early treatment with prednisolone or acyclovir in Bell's palsy. N Eng J Med 2007;357:1598-607. Nicastri M, Mancini P, De Seta D, Bertoli G, Prosperini L, Toni D, et al. Efficacy of early physical therapy in severe Bell's palsy: A randomized controlled trial. Neurorehabil Neural Repair 2013;27:542-51. Garg KN, Gupta K, Singh S, Chaudhary S. Bell's palsy: Aetiology, classification, differential diagnosis and treatment consideration: A review. J Dentofacial Sci. 2012;1:1-8 . Vasconcelos BC, Bessa-Nogueira RV, Maurette PE, Aguiar Carneiro SC. Facial nerve paralysis after impacted lower third molar surgery: A literature review and case report. Med Oral Patol Oral Cir Bucal 2006;11:E175-8. Scully C, Felix DH. Oral Medicine-Update for the dental practitioner Disorders of orofacial sensation and movement. Br Dent J 2005;199:703-9. 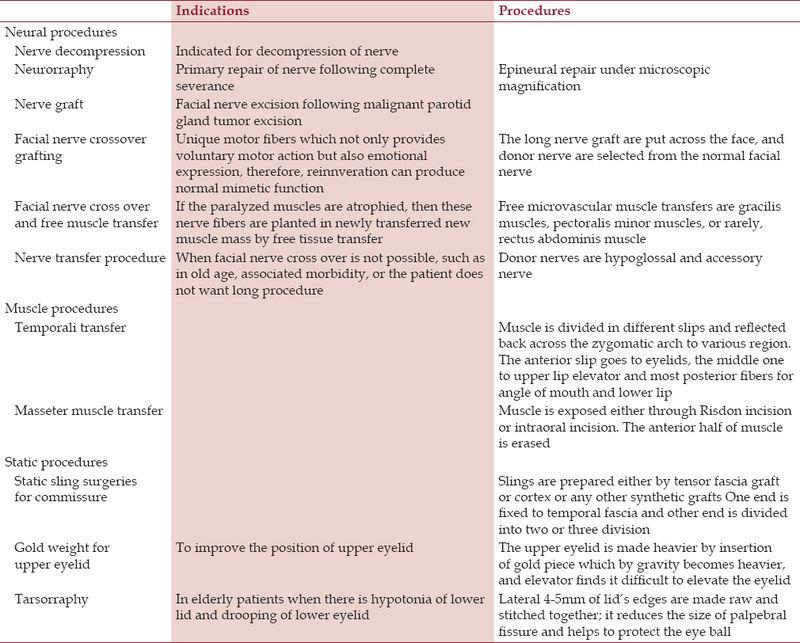 Makeham TP, Croxson GR, Coulson S. Infective causes of facial nerve paralysis. Otol Neurotol 2007;28:100-3. Redaelli de Zinis LO, Gamba P, Balzanelli C. Acute otitis media and facial nerve paralysis in adults. Otol Neurotol 2003;24:113-7. Keane JR. Bilateral seventh nerve palsy: Analysis of 43 cases and review of the literature. Neurology 1994;44:1198-202. Numthavaj P, Thakkinstian A, Dejthevaporn C, Attia J. Corticosteroid and antiviral therapy for Bell's palsy: A network meta-analysis. BMC Neurol 2011;5:1. Quant EC, Jeste SS, Muni RH Cape AV, Bhussar MK, Peleg AY. The benefits of steroids versus steroids plus antivirals for treatment of Bell's palsy: A meta-analysis. BMJ. 2009;7:b3354. Lockhart P, Daly F, Pitkethly M, Comerford N, Sullivan F. Antiviral treatment for Bell's palsy (Idiopathic facial paralysis). Cochrane Database Syst Rev 2009;7:CD001869. Yeo SG, Lee YC, Park DC, Cha CI. Acyclovir plus steroid vs steroid alone in the treatment of Bell's palsy. Am J Otolaryngol 2008;29:163-6. Salinas R, Alavarez G. Ferreira J. Corticosteroids for Bell's Palsy (Idiopathic facial paralysis). Cochrane database Syst Rev 2004;18:CD001942. Salinas RA, Alavarez G, Daly F, Ferreira J. Corticosteroids for Bell's Palsy. (Idiopathic facial paralysis) Cochrane database Syst. Rev. 2010;17:CD 001942. Seiff SR, Boerner M, Carter SR. Treatment of facial palsies with external eyelids weights. Am J Ophthalmol 1995;120;652-7. Mancini R, Taban M, Lowinger A, Nakra T, Tsirbas A, Dougles RS, et al. Use of hylauronic acid gel in the management of paralytic lagophthalmos: The hyaluronic Acid gel "gold weight". Ophthal Plast Reconstr Surg 2009;25:23-6. Donnenfeld ED, Perry HD, Nelson DB. Cynoacylate temporary tarsorrhaphy in the management of corneal epithelial defects. Ophthalmic Surg 1991;22:591-3. Ellis MF, Daniell M. An evaluation of the safety and efficacy of botulinum toxin type A (BOTOX) when used to produce a protective ptosis. Clin Experiment Ophthalmol 2001;29:394-9. Chen C, Malhotra R, Muecke J. Davis G, Selva D. Abberrant facial nerve regeneration (AFR): An under recognized cause of ptosis. Eye 2004;18:159-62. Chua CN, Quhill F, Jones E, Voon LW, Ahad M, Rowson N. Treatment of abberrant facial nerve regeneration with botulinum toxin A. Orbit 2004;23:213-8. Tate JR, Tollefson TT. Advances in facial reanimation. Curr Opin Otolaryngol Head Neck Surg 2006;14:242-8. Horlock N, Sanders R, Harrison DH. The SOOF lift: Its role in correcting midfacial and lower facial asymmetry in patients with partial facial palsy. Plast Reconstr Surg 2002;109:839-49. Grogan PM, Gronseth GS. Practice parameter: Steroids, acyclovir, and surgery for Bell's palsy (an evidence-based review): Report of the Quality Standards Subcommittee of the American Academy of Neurology. Neurology 2001;56:830-6.